Episode #124: Reign Of The Supermen Month Week 4: Superboy! 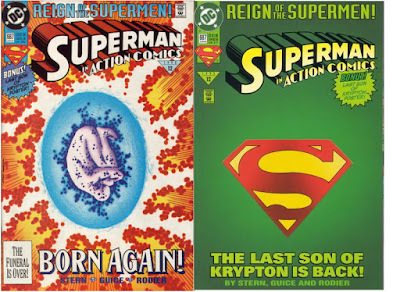 The two covers for The Adventures Of Superman 501, which introduced the new Superboy! 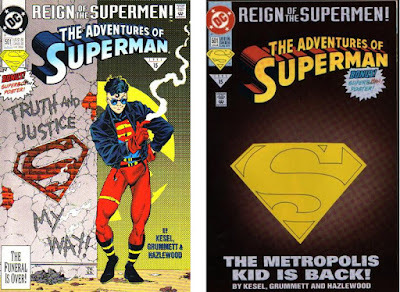 Our look at the four Supermen who were introduced in the Supermen titles cover dated June 1993 ends with Superboy, who would come to be known as Conner Kent. He was introduced in THE ADVENTURES OF SUPERMAN 501, cover dated late June 1993, Triangle number 15, 1993. 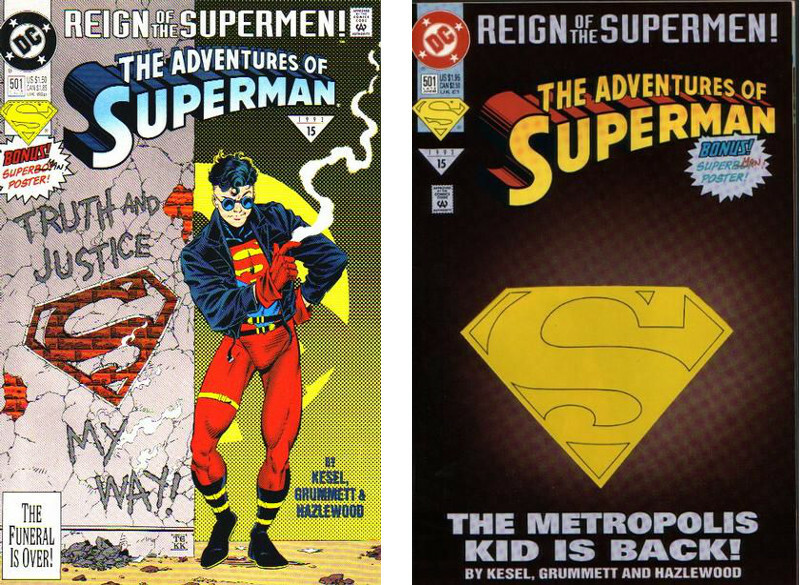 All four titles introducing the four "Supermen" were published on the same day, April 27, 1993.. This episode explores his creation as a clone of Superman, and the twists and turns as a superhero through the LAST STAND OF NEW KRYPTON mini-series. Next episode: HAPPY BIRTHDAY, DENNIS O'NEIL & FREE COMIC BOOK DAY 2010! EPISODE 126: ACTION COMICS 125 & SUPERMAN 125! 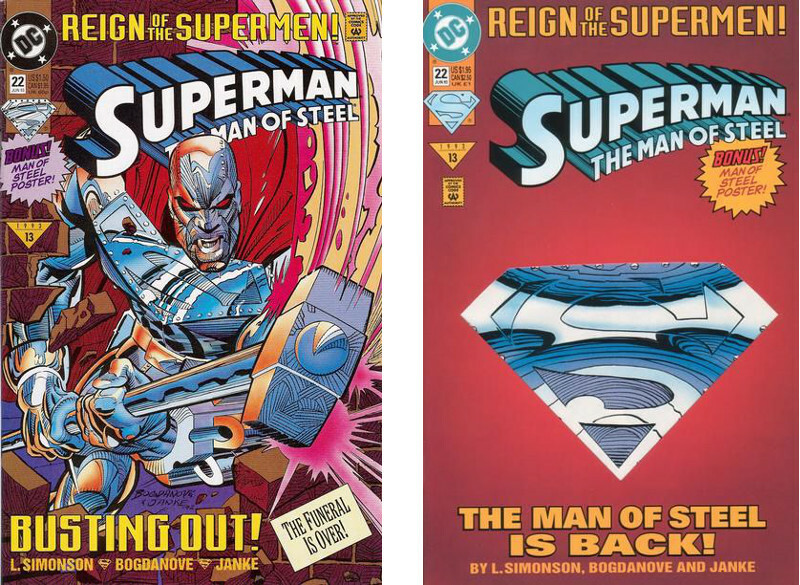 Episode #123: Reign Of The Supermen Week III: Cyborg Superman! 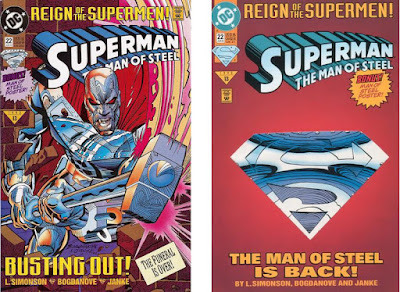 The two covers for Superman 78 (1993) featuring the introduction of the Cyborg Superman! The third member of the four Supermen introduced in the June 1993 cover dated issues of the Superman titles was the Cyborg Superman. He first appeared in SUPERMAN 78 (Triangle Number 14 for 1993). Like the other three issues with the June 1993 cover date, SUPERMAN 78 was published on the same day of April 27, 1993. 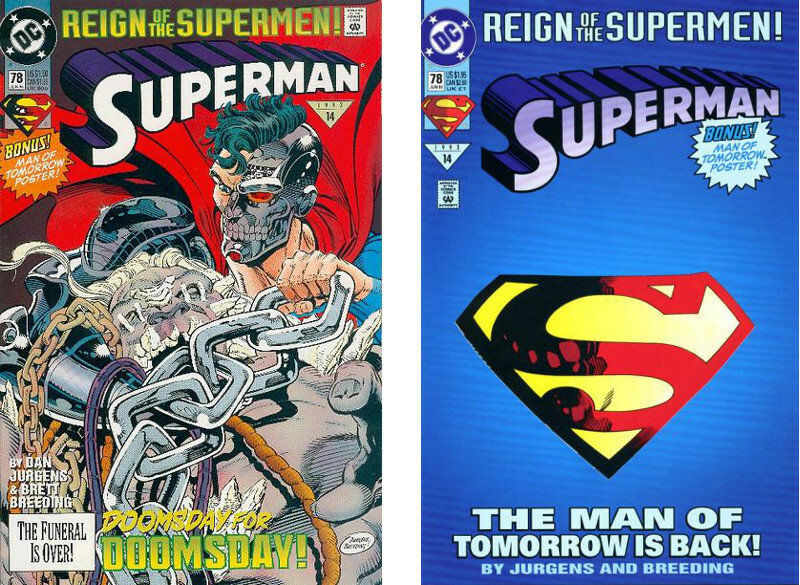 This episode covers the origins and history of the Cyborg Superman from his first appearance in SUPERMAN 42, April 1990, to his history after the end of the REIGN OF THE SUPERMEN story. Next Episode: REIGN OF THE SUPERMEN MONTH WEEK IV: SUPERBOY! Episode #122: Reign Of The Supermen Month Week II: The Man Of Steel! The two covers for Superman: The Man Of Steel 22, introducing Steel! The second of the four Supermen to be introduced during the beginning of the REIGN OF THE SUPERMEN story was Steel, in SUPERMAN: THE MAN OF STEEL 22, (triangle number 13). As with the other three titles cover dated June 1993, this issue was published on April 27, 1993. This episode explores his origins and history in DC Comics. Episode #121: Reign Of The Supermen Month Week I: The Eradicator! 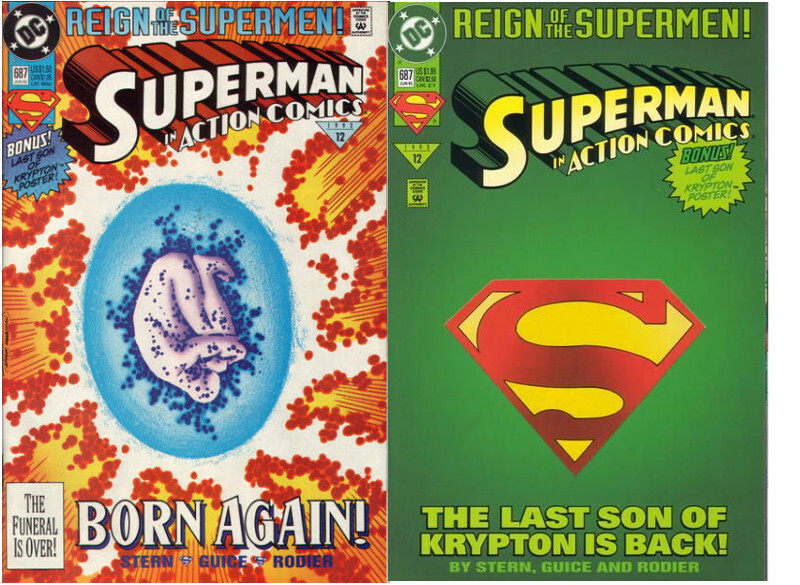 The two covers for Action Comics 687, where the Eradicator first appeared as the Last Son Of Krypton! The REIGN OF THE SUPERMEN storyline would usher in the return of the real Superman. In an unusual move DC introduced these four possible replacements for the Man of Steel each in one of the four Superman titles of the time, cover dated June 1993. All four titles were published on the same day, April 27, 1993. This was during the triangle numbering era of the Superman comics. Superman's first possible replacement appeared in ACTION COMICS 687, Triangle #12, and would come to be known as the Eradicator. The Eradicator first appeared ina different form in ACTION COMICS ANNUAL 2, 1989. For more information about the Eradicator's origins listen to Episode 103 of this podcast:. Next Episode: REIGN OF THE SUPERMEN MONTH WEEK II: THE MAN OF STEEL! Episode #120: The DAILY PLANET: June 28, 1973! The front page for the Souvenir Edition of the Metropolis Planet for the week of Thursday, June 28, 1973, sporting a Curt Swan Superman drawing! This episode was originally scheduled for the Week of March 31, 2010 for April Fool's Day. I don't really have a copy of the Daily Planet. It's more lake the Weekly Planet. What I can say is that it is the METROPOLIS PLANET, the newspaper of Metropolis, Illinois, published every Wednesday. I received this copy of the newspaper from my local comic book shop, ACME COMICS in Longwood, Florida http://acme-superstore.com. It was a commemorative edition for the opening of the Amazing World Of Superman Exhibition Center, the town's first Superman museum. This episode features some of the pictures and stories about the beginnings of Metropolis' adoption of Superman as its native son. The dates for the 2010 Superman Celebration are June 10 - 13, 2010. For more information go to: http://www.supermancelebration.net. 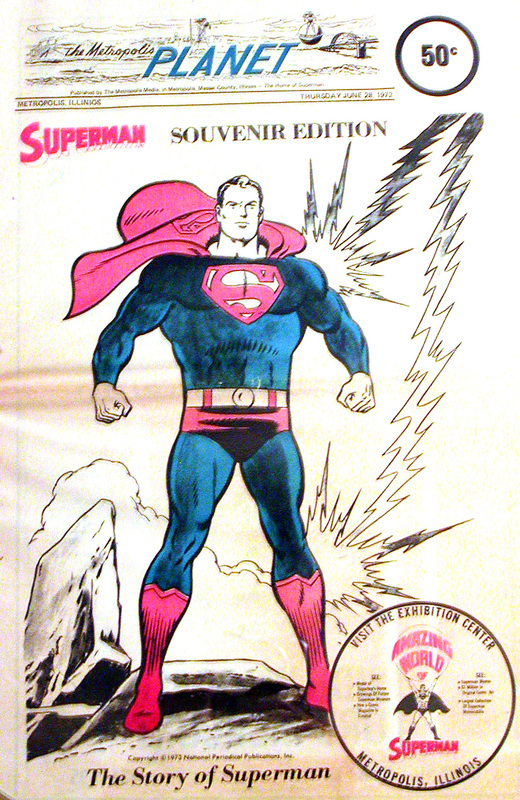 For more information about the current Superman Museum go to: http://supermanmuseum.com. Next episode: REIGN OF THE SUPERMEN MONTH WEEK I: THE ERADICATOR! Episode #119: WORLD'S FINEST COMICS #71: Superman & Batman: Together Again For The First Time! 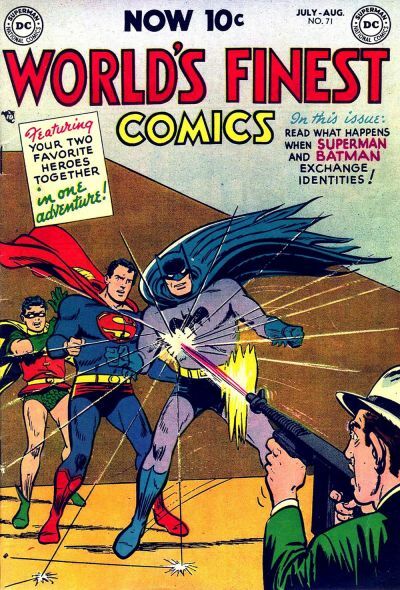 Continuing our celebration of DC Comics' 75th Anniversary, this episode features WORLD'S FINEST COMICS 71, July/August 1954, published around May 27, 1954. This issue featured the first team-up of Superman and Batman in that title. It was not their first team-up in comics, and their original team-up happened even earlier, in the Superman radio show. For a more detailed history of the Superman - Batman team go to Bill Jourdain's GOLDEN AGE OF COMICS podcast, episode 58, August 24, 2008: http://goldenagecomics.org/wordpress/2008/08/24/golden-age-of-comic-books-august-24-2008-58/. Next episode: THE DAILY PLANET, THURSDAY, JUNE 28, 1973! Me with Jeffrey Taylor (Right), co-host of From Crisis To Crisis: A Superman Podcast, and contributor to the Superman Homepage website! MegaCon 2010 took place from Friday, March 12 - Sunday, March 14, 2010 at the Orange County Convention Center in Orlando, Florida. I attended the convention with Jeffrey Taylor, contributing writer for the Superman Homepage website at: http://supermanhomepage.com. Jeffrey accepted the award for the favorite comic book fan website from Project Fanboy at their Sunday panel. Jeffrey and I discuss our experiences at MegaCon. We weren't able to touch everything that occurred, so go to the following links for our complete coverage. Jeffrey also has some of our pictures from MegaCon with his reports. Next Episode: WORLD'S FINEST COMICS 71: SUPERMAN AND BATMAN: TOGETHER AGAIN FOR THE FIRST TIME!